“The Bridge on the River Kwai”, an Oscar- winning film, based on a French novel by Pierre Boulle, was produced by a British film maker in 1957. The film, directed by David Lean, received widespread critical acclaim and won seven Academy Awards, including Best Picture, and it had a cast including renowned actors Alec Guinness, William Holden and Jack Hawkins. This film, though a work of fiction, had used the historically true fact of construction of a railway near Thailand-Myanmar border by British prisoners of war, during second world war. The real bridge on the River Kwai is located in Thailand, and stretches over a part of the Mae Klong river, which was renamed Khwae Yai (Thai for big tributary). However, the film, which revolves around construction of the bridge by British prisoners of war, that would be used for carrying Japanese soldiers to the front-line, was actually shot in Ceylon (Sri Lanka). In this film the bridge gets destroyed at the end by the action of allied agents. The scene in which the replica bridge is blown up has become one of the most famous in cinematic history. Leaving aside celluloid romanticism, the real railway line near Thailand-Myanmar border, which was built by prisoners of war was a terrible tragedy for many of the prisoners of war as well as for forced labourers and is known as “Death railway.” It was Built by the Japanese between 1942 and 1943 to shuttle supplies from Thailand into Myanmar, then called Burma. This railway route was long considered by Engineers as impossible. This 424 Km( 263 Miles) long railway line took 14 months to get carved out of dense jungle and mountains under orders from Japanese captors. Out of about 60000 prisoners of war forced to work on this railway line, about 13,000 POW's succumbed to abuse, malnutrition and disease and died during construction of this railway line. Besides the POW's, 80,000 to 100,000 Asian civilians, who were used as forced labour, also perished in the railway's construction. Unfortunately no markers or graves were left by the Japanese captors, for these Asian civilians. The dead POW's included 6,318 British personnel, 2,815 Australians, 2,490 Dutch, about 356 Americans and a smaller number of Canadians and New Zealanders. This railway link was destroyed by Allied bombers in 1945. Myanmar (Burma) has now decided to restore a stretch of the infamous “Death Railway” to Thailand. A feasibility study on the 105-km (65-mile) stretch running from Myanmar's “Three Pagodas Pass” area to Thailand, is scheduled to begin in October. This stretch of railway line mostly passes through areas controlled by Myanmar's rebellious 'Karen ' ethnic groups. However, in a major breakthrough, Myanmar's Government managed to get 'Karen' rebels to sign a ceasefire agreement with the Government. This railway is widely expected to provide a much-needed economic shot in the arm for the impoverished area, by boosting trade with Thailand and attracting tourists. Minister in charge of Railways, ' Aung Min ' says that “ We will reopen this (rail)road. The other countries said they would also help us and we will continue working for it. We will do a survey and try to start working after the rainy season with the help of the international community." Let us return to Sri Lanka, where scenes of the film were shot. The river in Sri Lanka, where the film was set is at a place known as Kitulgala, two hours' drive from the capital Colombo, and the river itself is commonly known as Kelani. The explosion scene, where the bridge gets destroyed, had to be shot twice in 1957 after a cameraman failed to give the correct signal to director David Lean. Elephants were used to haul the train out of the river for the second take and locals used the wooden debris to build homes or keep as souvenirs. There are beautiful white-water rapids near the remains of the broken bridge set up for the film. With the film almost becoming a legend, the film set with the destroyed bridge and nearby white water rapids, has became a natural tourist attraction for visitors to Sri Lanka. Today there is no bridge and only a few concrete posts remain. 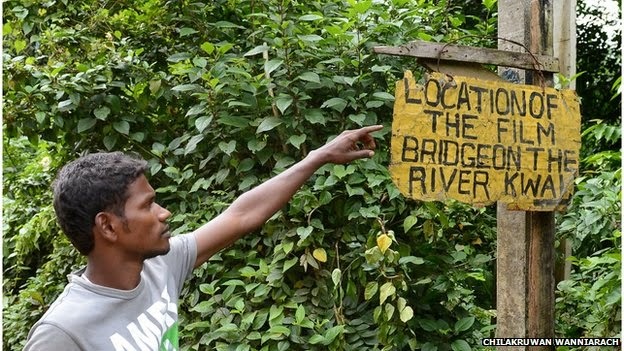 However, a new problem has arisen, because Sri Lanka's Electricity Board has decided to dam the river as part of an $82m hydroelectric project. 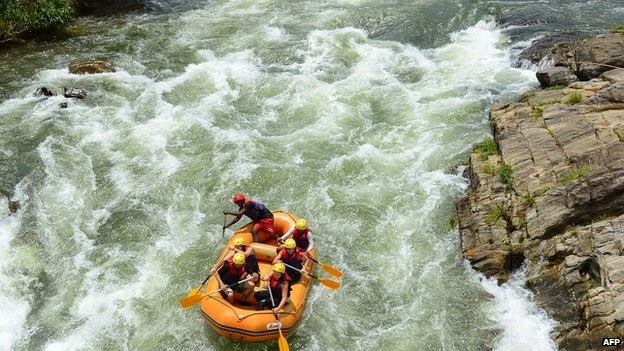 This means that the white-water rapids are soon going to disappear and the locals who presently depend on the revenue from the tourists for their living are likely to loose their source of income. Locals are now raising concerns that they would lose their income if the new dam comes up. To assuage the anger among locals over loss of income because of the controversial dam project, the electricity board now says that it will pay for the reconstruction of a new wooden bridge, built on the original's foundations, to attract fans of the Oscar-winning movie. 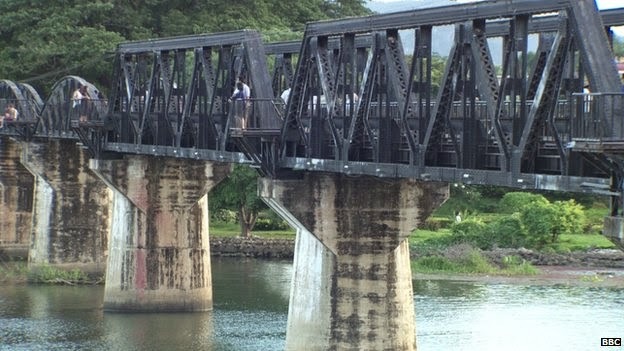 This means that after 57 years after it was blown to smithereens, the Bridge on the River Kwai, though originally built for the express purpose of filming, being blown up, would now be re-build for tourists. Sri Lanka's Tourism minister says that the rebuilt bridge, along with a new visitor museum, will guarantee that Kitulgala would remains on the tourist map of Sri Lanka.